The Spanish-Colonial style Villa Santa Catarina is on the shores of volcano- ringed Lake Atitlán. 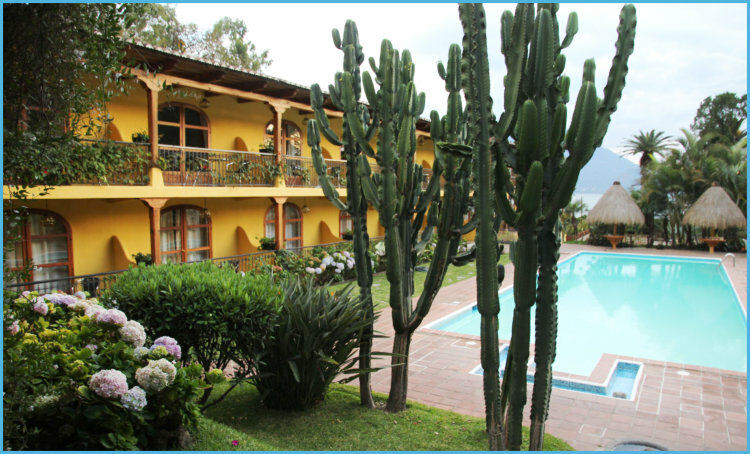 In the beautiful gardens are a large swimming pool and a smaller pool served from a hot spring. Each room has a balcony overlooking the garden but our room at the end of the block also had a full size window overlooking the lake and volcanos. The room was basic but comfortable, with no drinking water. The food and service was good. They put a pot of coals in the outside area of the restaurant in the evenings as it was rather chilly. Wifi is only available in the small reception or open air table area outside the restaurant. Santo Domingo was the first monastery in the city and the monks were the very first printers in Guatemala. 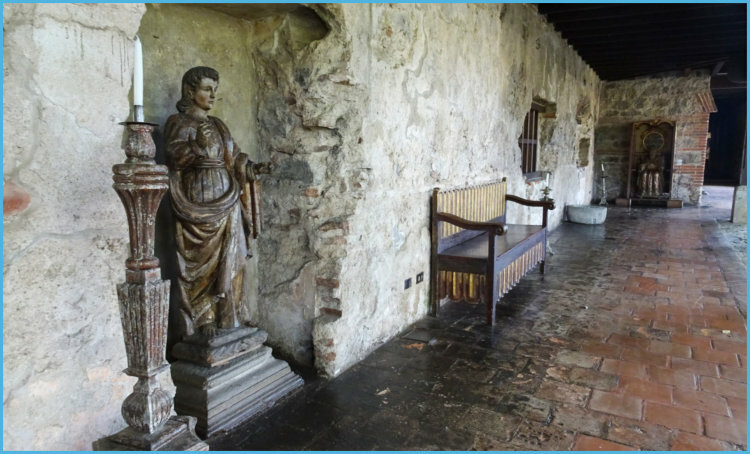 Casa Santo Domingo is a hotel built to restore and embrace some of the former 16th century convent whilst retaining some of the ruins in the garden. It has beautiful, well maintained gardens, colonial courtyards and fountains, a collection of colonial objects scattered in the corridors, ancient ruins, two museums (one of ancient relics and one of silver), as well as the works of local artists. 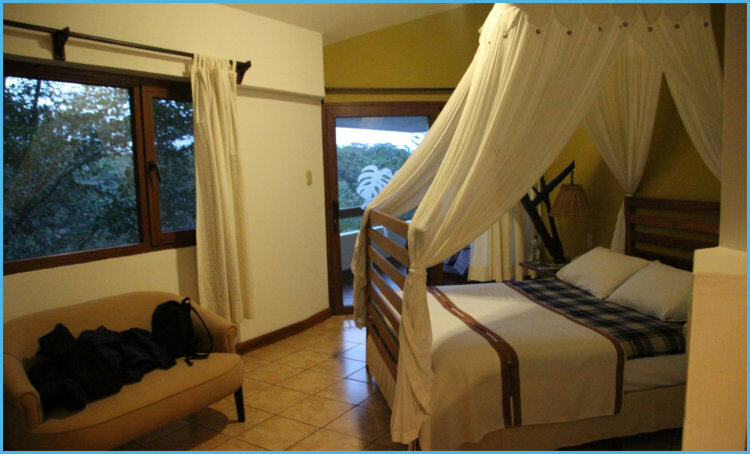 It’s in an excellent position being only 4 blocks from Antigua’s main plaza (about a 5 minute walk). There is a charge for bottled water in the room. The dining room is open to the elements so was very cold at breakfast time. 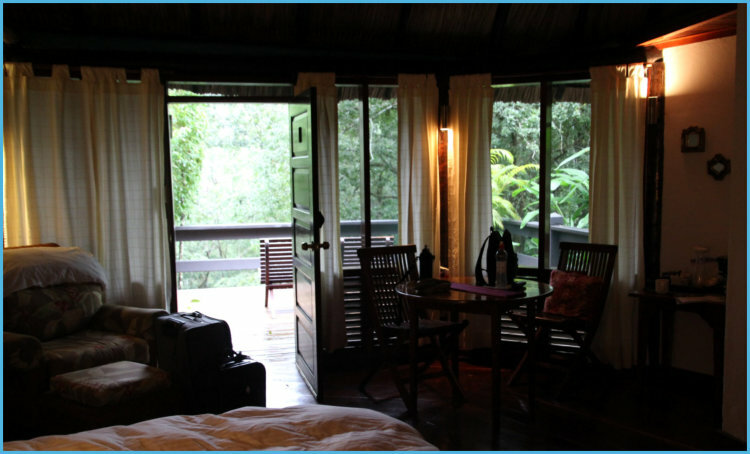 Villa Maya is in a remote area on the shores of the Petenchel and Monifata lagoons in a private natural reserve, 15 minutes from the Flores airport and 1 hour from Tikal. There are nature trails around the lake and gardens, and four resident macaws. The howler monkeys can be heard every evening. Their Junior suite is not a suite at all but simply a double room with a small settee and balcony. Also advertised is a jacuzzi which doesn’t exist and a children’s pool which is so dirty and unmaintained that you wouldn’t want to put a child in it. There was a charge for drinking water. They claim to be eco-friendly, but how can it be when there are notices to put toilet paper into the plastic bag in the bin – and then they replace the bag with a new one, even with only 2 sheets of ‘clean’ paper in the bin. They seem to prefer plastic bags over degradable toilet paper! Itza Lodge is on Long Caye on Lighthouse Reef, about 70km off the mainland coast. It’s a long boat ride to get there (about 2 hours in an open boat, which can be uncomfortable in bad weather) however, is about a 20 minute boat ride to the Blue Hole. Meals are served in a thatched open-air dining room with views over the Caribbean to nearby Half Moon Caye. 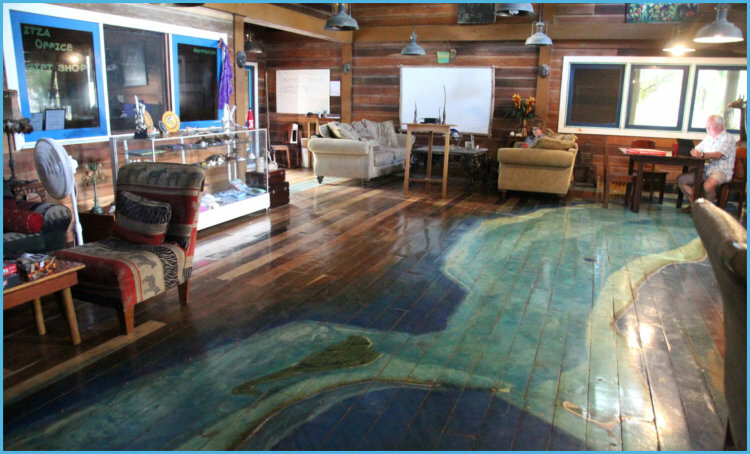 The lounge has an impressive large map of the atoll painted on the floor. As you would expect for a remote island, the lodge is basic. There is no air conditioning but it’s on the west side of the island so is very windy always. The shutters in our room did not close properly so the wind whistled during the night. Electricity is on solar during the day and generator at night (which was very noisy and could do with some insulation). The hot water supply was unreliable. Insects are a problem so you need an excellent repellent. The food is a set menu but the chef is willing to vary it slightly for individual tastes. Very sadly they ran out of red wine and despite the arrival of a replacement manager, the boat brought no wine with it. Boat transfers are twice a week). There were several unhappy people! Chaa Creek is a 330-acre private reserve in forested foothills. The bay- leaf palm thatched cottages, (casitas) are nestled along the Macal River where the Chaa Creek joins the river. There are miles of walking trails through orchid-draped forests, and some 250 species of birds have been recorded. There are about 72 Mayan structures in the grounds. The lodge has won numerous awards. Prince Harry stayed in a tree lodge there in 2012. The rooms are very dark and the lighting is insufficient to be able to easily read a book in the evening. They wash the floors daily, even in the severely wet weather when they won’t dry so it becomes very slippery and dangerous. They are eco friendly in that they give you a water container that you fill from the daily infused large water container in the bar – there were some wonderful infusions. Also they use paper bags in the bins which are much more disposable than plastic bags. However, they remove the towels even after one use in the shower. I much prefer a system where you leave towels on the floor of the shower when they need replacing. Why wash them unnecessarily?